Forecast for shares income, including from the banks, remains solid. For the “glass half empty” thinkers, there is plenty of bad news to focus on in 2019 – the Trump trade war, Brexit, falling house prices, the final report of the Financial Services Royal Commission, political risk and more. In the Australian market, bank dividends could be squeezed and Telstra has already cut its dividend by 30 per cent. So, it looks like being a tough year for dividends, right? On the other hand, the “glass half full” brigade can point out that the 2018-19 financial year might just be the biggest year for dividends at the market level, particularly if one includes special dividends and tax-effective, off-market buybacks. So far, the banks have not cut their dividends, despite taking some big one-off hits to profits thanks to the Royal Commission. Yes, Telstra has cut its dividend and we are not sure investors are going to get that cut reversed any time soon. But diversified resource companies have filled the dividend coffers, with Rio Tinto paying record amounts and large rises for the likes of Alumina and BHP Billiton. On top of that, BHP has announced it will be paying a large special dividend, and BHP and Rio have already completed large capital management programs that effectively return huge fully franked dividends to Australian investors via tax-effective, off-market buybacks. All up, BHP will return $US10 billion on top of its normal, significantly increased dividends, and that does not even count the value of franking. Woolworths may also announce a capital management program or special dividend once the sale of its petrol stations is completed. Banks have maintained their dividends in 2018 despite one-off expenses associated with the Royal Commission. While $1.5 billion in pre-tax legal and remediation costs seems large, after tax it is relatively small in the context of approximately $30 billion in annual post-tax profits for the big four banks. When averaged across the 10 years of the Royal Commission review period, it represents less than 1 per cent of annual bank profits over that time. Although we do not predict near-term dividend increases from the banks, at current prices they are all trading on strong dividend yields and below average price-earnings (PE) ratios. The fact that none of the banks cut dividends in 2018, when they could easily have used the Royal Commission excuse, suggests they are reasonably confident they can maintain current levels. To forecast the risk of companies not paying dividends, Plato has developed a proprietary dividend-cut model. 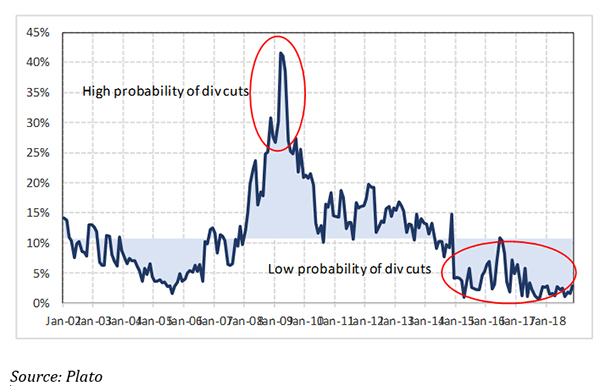 It forecasts the probability of a dividend cut for each dividend-paying stock in the S&P/ASX 300. When this model is aggregated across stocks it gives a picture of the current dividend outlook for the Australian sharemarket. Figure 1 below shows that to the end of November 2018 the model was forecasting a low probability of dividend cuts across the market, and tracking close to the lowest probability over the past 16 years. (Note that a low probability is good and a high probability is bad.) In the middle of the Global Financial Crisis, the model was predicting probabilities in excess of 40 per cent. We see no reason why dividends cannot hold up in 2019, and recent share price declines have increased the expected dividend yield of the Australian market. We forecast that Australian shares will provide substantially more income than cash and bonds in 2019. Low inflation and a softening housing market in Sydney and Melbourne suggest the official cash rate is likely to remain stubbornly low at 1.5 per cent for some time. Overall, we think the outlook for dividends is strong for the Australian market in 2019. However, it would be remiss not to mention potential political risk. The polls are currently leaning towards a Labour victory in the next federal election, and ALP policies include an increase in capital gains tax (smaller discount for long-term capital gains), restrictions on negative gearing and limitations on the refunding of franking credits. The latter may impact dividends. The ALP is not proposing to do away with franking credits. Rather, it is proposing that some investors, particularly fully self-funded retirees investing directly or via SMSFs, will no longer receive a net refund of franking credits. However, Australian investors would still be able to use franking credits to offset tax payable. While our analysis shows the impact may be large for some self-funded retirees, a lot much happen before any change happens. Not only does the ALP need to win the election, but they also need to persuade cross-bench senators that the policy is a good one. So, we caution investors not to panic. The silver lining may be that some companies flush out franking credits before June 30, and to do that they need to pay fully franked dividends. It could be that 2019, particularly the first half, may be a bumper period for franked dividends, including dividends released via off-market buybacks. Plato is an mFund Partner. mFund allows you to buy, hold and sell units in unlisted managed funds through a process similar to buying and selling shares. Learn more. This article appeared in the January 2019 ASX Investor Update email newsletter. To subscribe to this newsletter please register with the MyASX section or visit the About MyASX page for past editions and more details. This article appeared in the January 2019 ASX Investor Update email newsletter. To subscribe to this newsletter please register with MyASX. This article appeared in the January 2019 ASX Investor Update email newsletter.